25th September was observed as Antyodaya Diwas across the country to mark the birth anniversary of Pandit Deendayal Upadhyaya, a noted philosopher, historian and political activist. Antyodaya means uplifting of the weakest section of the society. He was coordinator and famous leader of Jan Sangh, which is considered precursor to BJP (Bharatiya Janata Party). He wrote drama Chandragupta Maurya in Hindi and later wrote a biography of Shankaracharya. Northern states of Punjab, Haryana, Uttar Pradesh, Himachal Pradesh and Union Territories of Delhi and Chandigarh have agreed to fix uniform tax rates on petroleum products, amid rising fuel prices. Besides, these states and UTs also have agreed to bring uniformity in taxes on liquor and registration of vehicles and transport permit. Decision in this regard was taken at a meeting of finance ministers of five states and officials of UT Chandigarh held in Chandigarh. It was initiative of Haryana Finance and Excise and Taxation Minister Captain Abhimanyu. 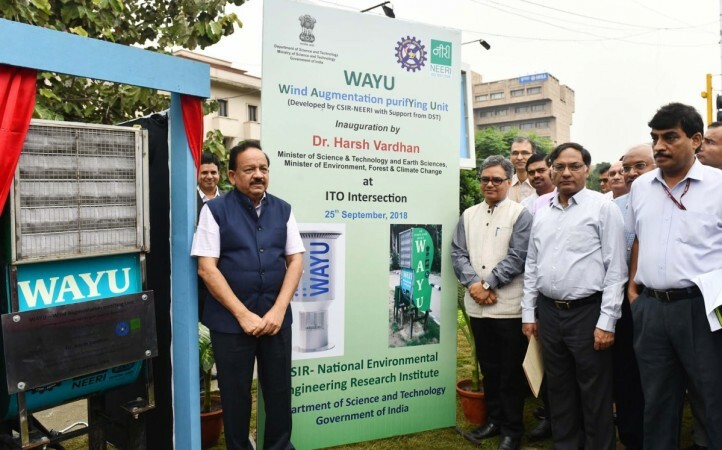 Union Minister for Science & Technology and Earth Sciences and Environment Dr. Harsh Vardhan inaugurated air pollution control device WAYU (Wind Augmentation PurifYing Unit) for traffic junctions at ITO intersection and Mukarba Chowk in New Delhi. The device aims at tackling toxicity in air by sucking in particulate matter and release fresh air. It has been indigenously developed by Council of Scientific and Industrial Research – National Environmental Engineering Research Institute (CSIR-NEER). Union Finance Minister Arun Jaitley launched portal www.psbloansin59minutes.com to enable micro, small and medium enterprises (MSMEs) to get in-principle approval of loans up to Rs.1crore within hour without need for branch visit from Small Industries Development Bank of India (SIDBI) and 5 Public Sector Banks (PSBs). Union Minister of Finance and Corporate Affairs Arun Jaitley launched Financial Inclusion Index in New Delhi. The annual FII will be released by Department of Financial Services (DFS), Ministry of Finance. It will measure access and usage of basket of formal financial products and services that includes savings, remittances, credit, insurance and pension products. The index has three measurement dimensions (i) Access to financial services (ii) Usage of financial services and (iii) Quality. Section 57 of the Aadhaar Act, allowing private entities to use Aadhaar for verification purpose, struck down. Aadhaar – PAN Linkage mandatory. No need of Aadhaar for CBSE, NEET, UGC and school admissions. No need of Aadhaar for mobile connections and for opening bank accounts. The Supreme Court of India on September 26, 2018 allowed live streaming and video recording of court proceedings across the country. The bench comprising Chief Justice Dipak Misra and Justices AM Khanwilkar and DY Chandrachud asked the government to frame rules in this regard under Article 145 of the Constitution. The top court stated that live streaming of court proceedings will bring accountability and transparency into the judicial system and serve the public interest. The Union Cabinet, chaired by Prime Minister Narendra Modi, on September 26, 2018 approved the National Digital Communications Policy 2018 (NDCP-2018), the new telecom policy of the country. The NDCP-2018 envisions supporting India’s transition to a digitally empowered economy and society by fulfilling the information and communications needs of citizens and enterprises by establishing a resilient and affordable digital communications infrastructure and services. 1. India and Morocco have agreed to enhance bilateral cooperation in the field of ___? 2. How many states have agreed to fix uniform tax rates on petroleum products? 3. Who can get loans up to Rs.1crore within hour from SIDBI through the portal www.psbloansin59minutes.com? 4. How many measurement dimensions does the FII index have? 5. Which section of Aadhar Act was struck down during constitutional validity of Aadhar verdict on September 26, 2018? 6. Under which article rules of live streaming and video recording of court proceedings across the country will be framed? 7. Which policy envisions supporting India's transition to a digitally empowered economy and society?